Buy Viridian Vitamin D3 2000iu Vegan - 60 capsules in the UK from our online shop or directly from our independent Scottish store. Many older people and those from the Asian community who tend to wear more modest clothing are amongst the population groups most like to suffer deficiency in vitamin D. Dietary sources include fortified foods, eggs and fatty fish. Most commonly-available Vitamin D3 supplements are derived from the lanolin in sheep’s wool. This vitamin D is vegan. 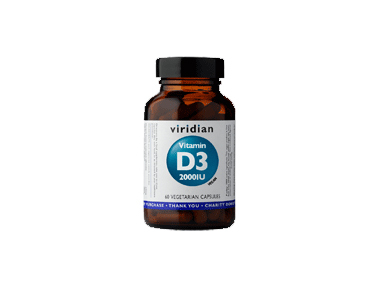 This supplement from Viridian Nutrition provides vegan Vitamin D3 naturally-derived from lichen. Where can you buy real Vegan Vitamin D3 2000iu safely online? If you are wondering where you can buy Viridian Vitamin D3 2000iu Vegan - 60 capsules safely online in the UK, then shop with us. Vegan Vitamin D3 2000iu - Viridian Vitamin D3 2000iu Vegan - 60 capsules in Vitamins A - Z and Vitamins and Minerals.